Are you excited to start your first semester at Baylor this fall? Do you have a heart for service & desire to impact the world? Join us for Missions Line Camp Experience in GUATEMALA! 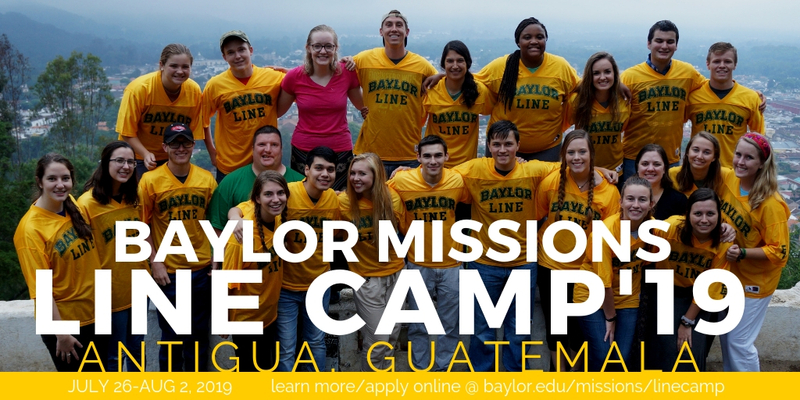 Line Camp Guatemala (LCG19) is an opportunity for incoming students to grow in your faith through international service and community building! Travel with Baylor Missions & New Student Programs to beautiful Antigua, Guatemala to serve alongside our global partners One More Child Global (formerly known as Orphan's heart) Applications due April 22 (4/18 early acceptance!). You'll know by April 24th at the latest if you're accepted. NOTE: $250 non-refundable deposit due on April 24 too so be ready!! we'll try to accept folks as we get applications complete! PLEASE READ INSTRUCTIONS FOR HOW TO APPLY USING BEARSABROAD!